Shown is the City of Hillsboro’s fire station on North East Street currently occupied by the Paint Creek Joint EMS/Fire District. The City of Hillsboro and Paint Creek Joint EMS/Fire District are set to close on a real estate deal next week, and the district’s board of trustees will likely accept Hillsboro as a member later this month — although the city will have to contract with Paint Creek for one more year if it joins the district because the deadline for registering an automatic fire coverage levy has passed. 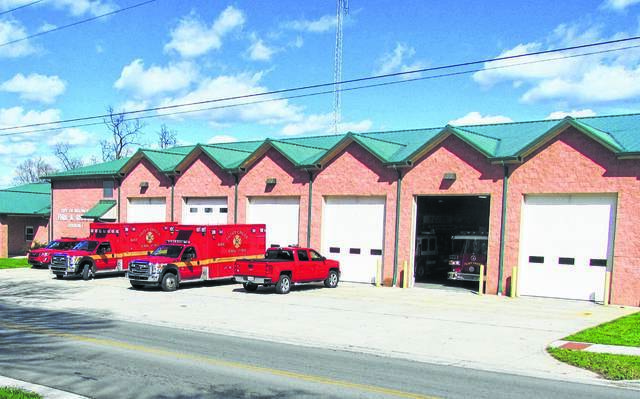 Hillsboro Mayor Drew Hastings said the city presented proof that the fire station’s deed is clear at a meeting earlier this week between Paint Creek board members and Highland County Auditor Bill Fawley. Board President Dan Mathews said trustees hope to seal the real estate deal next week. “That will take a lot of the pressure off of everybody,” he said. According to Hastings, the building will sell to Paint Creek for $720,000, and in exchange, Hillsboro will take ownership of Paint Creek’s former firehouse on Governor Trimble Place. With the real estate deal on the verge of closing, Mathews said Paint Creek’s offer for Hillsboro to join the district will likely be reissued at the board’s next meeting on Tuesday, Dec. 18. Mathews said the board will probably vote to accept Hillsboro as a member at that time. As previously reported, a problem with the North East Street station’s deed threw a wrench in ongoing negotiations for the property sale, and when the City of Hillsboro took the property off the market in an apparent bargaining move, Paint Creek withdrew a standing offer for Hillsboro to join the district as a member, demanding that Hillsboro sell it the property. Meanwhile, a deadline set by Fawley for Paint Creek to notify his office of Hillsboro joining the district came and went Friday, and an automatic 5.5-mill property tax levy for fire coverage will not go on the books until 2020 even if the city joins the district in 2018. Mathews said if the board votes to accept Hillsboro as a member, the city will have to contract with Paint Creek for one year until revenue comes in from the levy. Mathews said the contract price would be “close” to millage equivalent, which the city has been paying out of its General Fund for several years. Hillsboro currently pays the district roughly $570,000 per year for fire coverage, although Paint Creek recently sent the city a proposal that increased the contract price to $650,000. Hillsboro’s current contract with Paint Creek is up at the end of the year. As previously reported, if Hillsboro joins, a 5.5-mill property tax will automatically be put in place. According to Fawley, agricultural and residential properties would pay the equivalent of 4.8 mills, and the estimated yearly tax is $151.20 per $100,000 of valuation. Mathews said while the board can vote to accept Hillsboro as soon as Dec. 18, city council did not approve the appropriate legislation as an emergency, so there is a 30-day delay before it goes into effect. He said all will likely not be resolved until the new year. Hastings said all the city can do now is wait for Paint Creek to make a move. “It’s kind of in their hands right now,” he said.